Getting the perfect matched arrow takes time and relies on a number of factors, from overall arrow weight, to flexibility / spine of the shaft, fletching size etc. One of these factors is the weight of the pile or point. A heavier pile makes the arrow flex more, whilst a lighter pile makes the arrow stiffer. For this reason we have been trying to fine tune Sharons’ arrows (Easton X7) and have recently changed her points from glue in pins to screw in points with obvious inserts into the aluminum shafts. 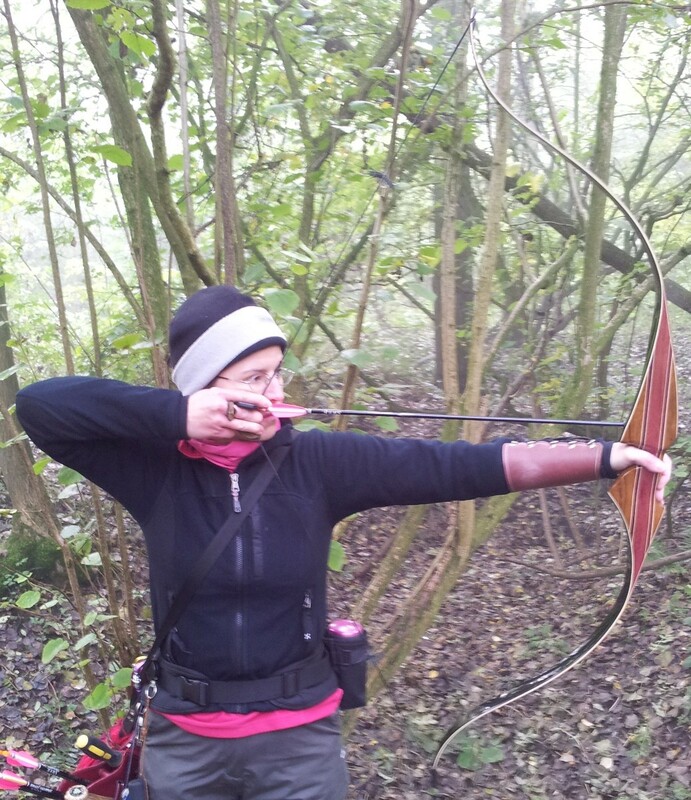 The X7 are great arrows, and work well from here bow but we thought we might get a slight improvement. By using inserts we have a greater access to different point weights to experiment with. The old piles came in at 60 grains and the feeling was it might be making the arrow a little too stiff. So we spent sometime looking at alternatives. By the way we have looked at going for carbon arrows but Sharon preferred the X7 as Carbon ones, as the carbons came in too physically light for here bow. I’ve used a 2 part epoxy glue to secure the inserts into the shafts, which appears to work well. 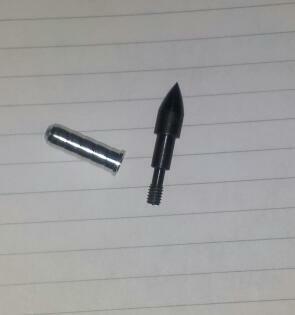 We’ve opted for these inserts and points which we got from Bow Sports. The inserts are 8/32 with 9/32bullet points. 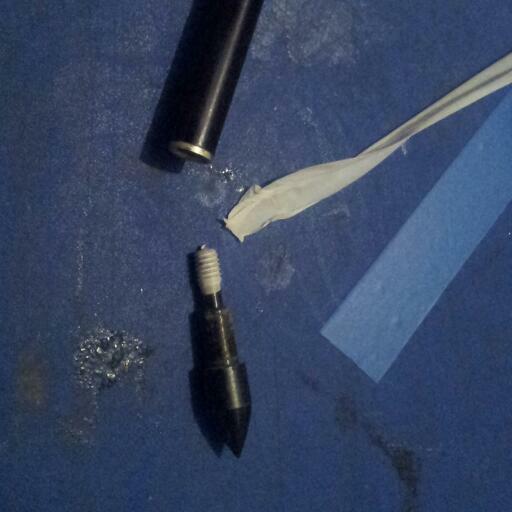 The one thing with we’ve discovered is that the screw in points sometimes work lose. Now the easy answer to this is to apply a little glue, the only problem with this being that if you need to remove the piles the only answer is to then heat it up to break the glues bonds, which will also break the bonds of the glue used to hold the insert in. One trick I’ve come up with using plumbers tape or PTFE tape. I cut a small piece about an inch in length and then wrap this round the threaded bolt, then screw this into the insert in the arrow. New pile, you can see the tape wrapped round thread. The result of using the tape is to make the threaded bolt a little tighter in the insert, so making it less likely to undo or loosen. Hope you find this of use and as always thanks for reading. Shooting an arrow that is not matched to your draw length and poundage can be dangerous as it may snap under the pressure if the wrong poundage, or you might draw it off the arrow rest if too short. Beginners often find their draw length increases as they get more used to shooting, so make sure any arrows allow for this. Likewise too light an arrow can damage your bow as there is insufficient strength and weight in the arrow to cope with the energy from the limbs, resulting in damaged limbs. The four-digit number refers to the outside diameter and wall thickness of the shaft. The first two numbers are the outside diameter in 64ths of an inch. The second two numbers are the wall thickness in thousands of an inch. For example, a 2514 shaft would be 25/64th of an inch in diameter and .014 of an inch wall thickness. OD and wall thickness are the two variables in controlling spine for aluminum arrows. For complete beginners I tend to use Easton Neo alloy shafts, they are 1618 and at full length 32 inches. They are great arrows for low poundage bows, up to about 24-26lb at 28″ above that they get a bit whippy. Another good arrow for a slightly more experienced archer is the Easton Jazz. They range from 14130 to 1916. I tend to find most beginners find the 1816 work well from their first bows that come in about 26lb-30lb. Here is a link to Easton Arrows selection chart http://www.eastonarchery.com/uploads/files/52_target-sel-chart.pdf this will help work out whats best for your bow. As the archer progress good alloy arrows are the Easton x7 (think they are 1614 going from memory) which Sharon uses (recurve 38lbs and 26″, yes 26″ not 28″) and work well for the field archery we do. I’ve got some XX75 that are pretty robust too, but I tend to shoot wooden arrows more. Please note I have no alliance or connection with any of the shops or manufacturers I mention here, other than being a customer. So I have no vested interest in this other that trying to help an offer my opinion. I hope this is of interest and if you have any questions drop me a line. Always happy to help if I can. Thanks for reading.